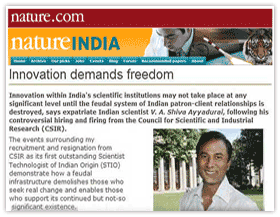 Nature India’s report on VA Shiva’s initiatives to monetize innovation at CSIR: Innovation demands freedom. 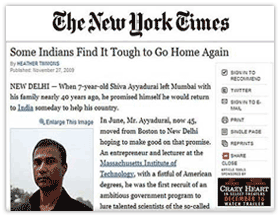 The New York Times reporting on the difficulties faced by VA Shiva: Some Indians Find It Tough to Go Home Again. 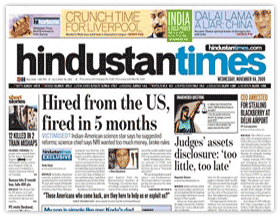 Article in Hindustan Times, one of India’s largest circulated newspapers: Hired from the US, fired in five months. 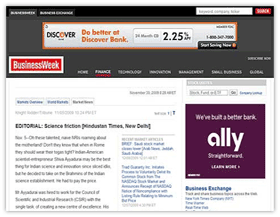 The Week: NRI scientist fires a salvo of accusations. The CSIR fires him in return. Editorial on the CSIR blunder in BusinessWeek : Science friction. 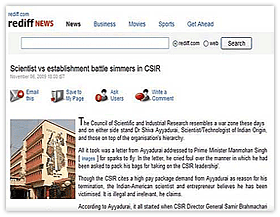 Rediff News, India’s largest online news source: Scientist vs establishment battle simmers in CSIR. 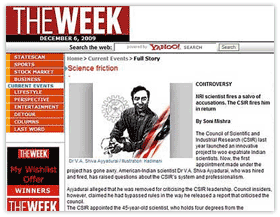 SiliconIndia Article: CSIR asks sacked Indian American scientist to vacate house. 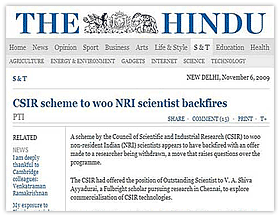 Article in The Hindu on the CSIR fiasco: CSIR scheme to woo NRI scientist backfires. 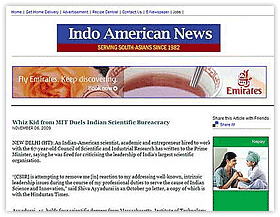 Indo American News on VA Shiva’s ordeal: Whiz Kid from MIT Duels Indian Scientific Bureaucracy.